The Italian Gardens in Kensington Gardens, London. 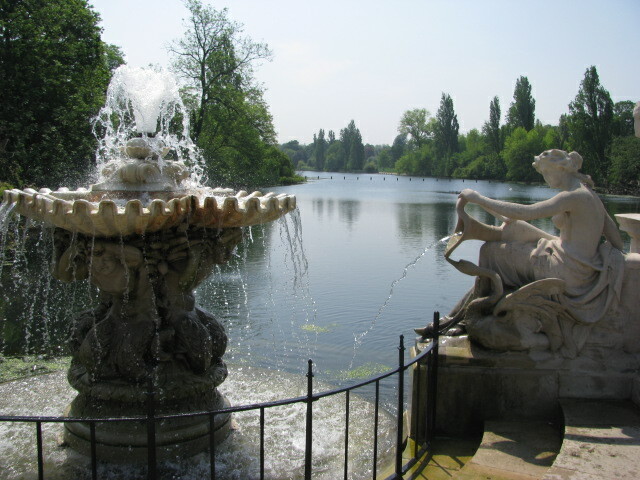 This entry was posted in Travel, Travel Photos and tagged 50 Year Project, Blog, Blogging, England, Europe, Italian Gardens, Kensington Gardens, Life, London, Long Water, Nature, Photography, Travel, Travel Blog, Travel Journal, Travel Photo. Bookmark the permalink. Ohhhh, that’s looks so beautiful and inviting!! Would you believe that we woke up this morning to our whole world covered in white again?? Too bad you’re going away or I might just have hopped on a plane this morning to come for a visit :). More snow. Wow you need a beach vacation. Hey, wait a minute!! You’re already going away in a couple of weeks LOL :). I should be going with you. I told you to get your shots. You probably have 5 or 6 that you need. Are you up to date with tetanus and Hep A and B? That would help. I knew there was something I had been forgetting to do :). Lovely picture on this rainy dreary Iowa Sunday morning. Now the farmers will be whinging about the rain instead of the drought!! Need my Wellies on to venture outside but I think I will just stay inside with a nice book and cuppa !!! Happy Sunday TBM! I hope you stayed inside and had a relaxing day. And I hope you are feeling better. Lovely! Kensington Gardens in Spring. That must be a magnificent place. I know this place well. It’s right at the Kensington Garden end of the Serpentine. The far end is in Hyde Park. One of my favourite spots, whenever I’m in London. It’s one of my favorites as well. Try to go there as much as possible. And, in the spirit of Mr. Rogers … It’s a beautiful day in the neighborhood. That’s a beautiful, peaceful view! By the way, I have just heard about Boston…I hope no one you know is in the crowd.